On Sunday, I decided that today I will keep myself away from all distractions. So I switched off my Laptop and the TV. There was on one at home. It rained the whole day, so i couldn't even go anywhere. But I didn't mind it. Because I had the best company one could ever hope for ! I discovered that there is something very comforting in the sound of rain falling softly around you. And that there is no perfume on this earth that can match the smell of wet earth ! So how did you spend your Sunday ! you did the bets thing ya!!! it was a lovely cloudy windy day...nature heritage, my partner....and then rains!! Ohh humayun Tomb must have been lovely on a rainy day .. All that greenery ! Ah, I prepared butter chicken for lunch as a special treat for hubby on Father's Day. He had made breakfast :). I caught up on my episodes of Law and Order that I record during the week, helped younger one with homework, and in between kept going back to Outliers that I am reading again. The weather is blissful! Maid had taken off so had to do utensils while others did the cleaning. Not exactly an uneventful day but this is as uneventful as it gets in my life :). I would say that was an eventful day Rachna ! Butter Chicken yum yum ! How are you liking the help ? Cookies on a Rainy Day - yummy ! well you had a busy day ! I suppose Sundays are meant to laze around ! You said it ! Bliss indeed ! Now that's a perfect Sunday! So it was Bhavya ! Nothing like a rainy Sunday to curl up with some books, is there? I had two non-Sundays like that recently! No there isnt Corinne ! Lucky you to enjoy this pleasure on Non Sundays ! oh yes! 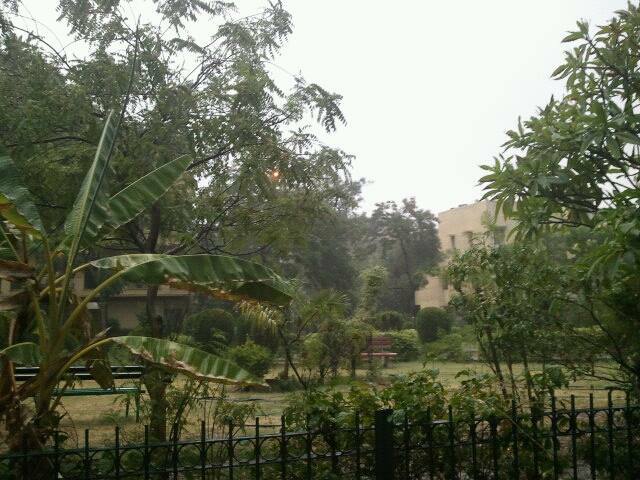 Books, rain outside with the perfume of mitti wafting in, a garam chai and a nice blanket to snuggle in! How did you like the Help? And, can you give me the name of the Raza Rumi one..I can't quite read that! I haven't started on the Help yet ! The Raza Rumi One is Delhi by Heart. He is a Pakistani journalist and this book is his take on Delhi ! So do I :) Welcome here ! Oh it was Father's Day so the princess had a few aces up her sleeve. All in all..........a family day. But loved the fact that you had apt company for the weekend. I saw the Father's day pics. Tiara did have a few aces up her sleeve didn't she ! That's a wonderful way to spend Sunday! 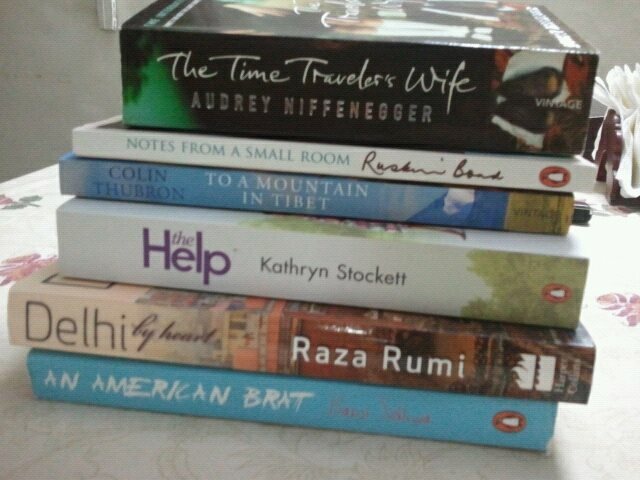 I lazed, shopped, read and it was bliss! Woke up late, watched MTV, danced a little, read newspaper, poha and hot coffee for breakfast, chit-chatted with family, rajma chawal for lunch, read A thousand splendid suns, stepped out with sister in the evening, had coffee and cake..! What did I do this sunday? I hate watching TV and so in normal weekdays after a hectic 9 to 5 job I need only writing to fill evenings and of course cooking (need of the hour :|) but come sunday and there is one thing I need. Morning 10 to 12.30 of unadulterated friends on Zeecafe. I found this very recently that season nine was being aired, and so that is the only tv I watch. and I envy your books, except for time traveller I havent read the rest. Leme know how are they? I can see u have a Ruskin Bond book too! I love reading his books on Sundays!